The scale is a good way to mark your progress but it isn’t the only way and the numbers on it can be deceptive. For example if you are doing a full body health and fitness regime that includes resistance training, diet and cardio you could find the scales may not always tell the whole truth and the answer to the question “How much do I weigh?” may not be giving you the whole picture. Remember the old riddle, “how much does a pound of feathers weigh?” Well a pound of course! A pound of feathers weights the same as a pound of rocks, and a pound of fat weighs the same as a pound of muscle. This is part two of the short series of 40 things that people screw up when it comes to their fitness and health. If you haven’t read part one it is Resistance Training or Weight Training. As you are working towards your goals you could easily be gaining muscle while you are losing fat. The scales play no favorites on the day you weigh in and will show you only your total weight and not the amount of fat loss only. Another drawback on the scale is the average home use scale doesn’t measure partial pounds. So if you have lost 1.4 pounds the scale may only show one pound, or if you drop 1.6 pounds the scale will show 2 pounds. Let’s say this happens in the sequence of the first week you drop 1.6 pounds but you think you have dropped two and you are really happy. Then the next week you lose 1.4 pounds. 1.6 plus 1.4 in the two weeks is three pounds in total. Now you think you only dropped a pound and you are worried you doing something wrong. When in fact there was only 0.2 pounds in the difference from week to week and not an entire pound – so your weight loss is actually more consistent than you had thought. 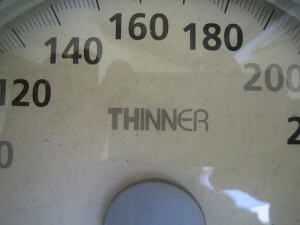 Another bother with the scale is addiction; jumping on morning and night or day by day. This will only drive you batty, spend that time planning your exercise or your meals and sure it’s okay to keep a running chart on your weight loss but don’t let it rule your mood. Many other things could be affecting your weight according to the scales like; temporary water retention, undigested food, bloating and the like. Add other means of measuring, old jeans, measuring tape etc. It’s nice to see progress but if you are moving and living healthily you will with certainty see what you are hoping to see on the scale someday soon.